You proudly admire your new waterproof deck. You love the spongy feel of the rubberized coating under your bare feet. You revel in the freedom of not having to worry about water damage. You pat yourself on the back for being so wise as to protect your investment in a way that enhances the value of your home. But then reality sets in. Nothing lasts forever. 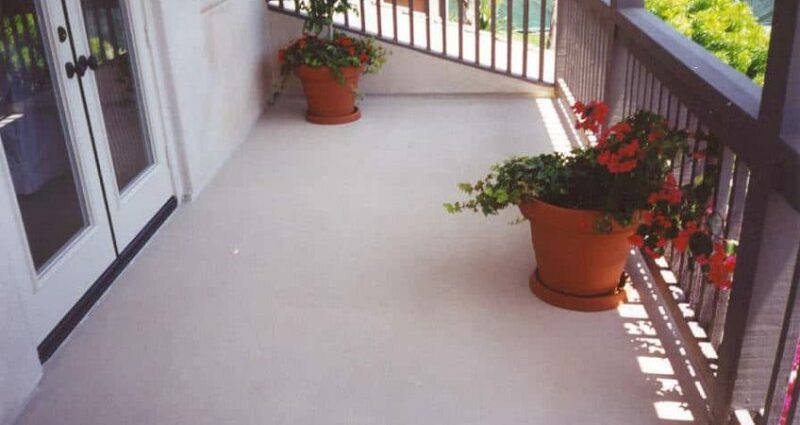 Just what should you know about maintenance on a waterproof deck coating? Well, just like you don’t have to worry about rain on your deck, there is no need to worry about rain falling on your celebratory parade. Yes, maintenance is necessary but it shouldn’t break your back or your bank account. Nail or screw heads breaking through from the subsurface. Signs of de-lamination or bubbles. Stains from water drips below the deck surface. Signs of rust on metal flashings. Signs of loose or damaged metal flashings. Regular inspection is the key to avoiding future problems. Dry rot is one thing to look for. This can occur when certain types of fungus invade support timbers and begin to digest the wood, weakening the lumber. Although the surface of your deck may be treated and waterproofed, underlying timbers may still be exposed to humidity that can create conditions for fungus to occur. If areas of the substrate feel too spongy underfoot, that could be a sign of dry rot. An infestation of termites is just as bad as dry rot. The conditions termites create within structural lumber are also similar. Examine underlying structural supports for signs of termite damage and test substrate soundness for any signs of weakness. A routine inspection should also determine that downspouts and gutters are draining properly. They should be clear of debris. Water-flow should also be heading in the right direction, away from the structure and not pooling at the edge of a building’s foundation or structural supports of a deck. The primary purpose of a deck is for outdoor entertainment. It is highly likely that it has been filled with patio furniture, plant containers and possibly a barbecue grill. All of the furnishings should be moved in order to inspect the integrity of the coating underneath. Points of pressure could create areas of wear that damage the elastic membrane. Hot coals and embers from barbecue grills can burn through the waterproof layers of a deck coating. Consider the routine care you provide for your car: a wash and wax. Taking care of a waterproof deck is similar. Routine washings are good to cleanse away dirt and debris that could damage and scratch the surface of the coating. It is recommended that every 2-3 years a new layer of top coat sealant be reapplied. Typical use eventually wears through a topcoat. To maintain the color vitality and durability of your waterproof deck, don’t neglect to touch it up with a fresh top coat. Most likely the initial reason a homeowner chooses a waterproof system for a deck is to protect their investment. Don’t ruin your chances of success by foregoing inspections and maintenance. If you are unsure of the correct procedures, put your trust in an expert. An experienced professional in the waterproofing industry can conduct a thorough inspection each year. Resolutions for any problematic areas can be implemented and possibly save a homeowner the headache of costly repairs in the future. If you have any questions or need the services of skilled technicians, please contact us.